Are you suffering from tendonitis or chronic pain? Has this condition been nagging you for a period of time? Ultrasound Guided Dry Needling is a powerful and effective treatment used to treat many musculoskeletal conditions. Tendinopathies are a highly prevalent problem and conventional conservative treatments often do not correct the problem. A trigger point is an irritable, hard “knot” within a muscle that is painful when palpated and can produce significant pain over a large area. Trigger points are very common and can often make everyday tasks difficult. Often, these trigger points may be too deep to be effectively treated by other treatment techniques. Ultrasound Guided Dry Needling is the use of solid filiform needles for therapy of muscle and tendon pain. The technique uses a “dry” needle, one without medication or injection, inserted through the skin into areas of the muscles or tendons. The use of ultrasound is a specialized procedure that ensures accuracy in inserting the needle into the affected structure. 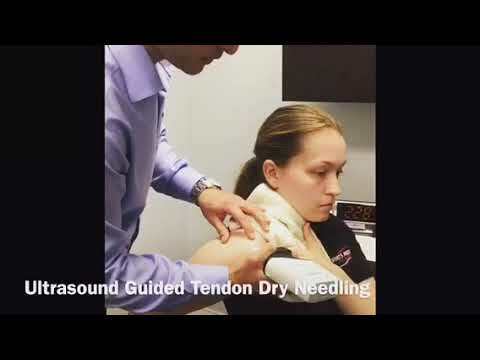 How does Ultrasound Guided Dry Needling work? Ultrasound Guided Dry Needling works by advancing the needle into the muscle trigger points or areas within an injured tendon to promote healing by increasing blood circulation in the affected area. Patients are still required to perform a very specific exercise program to maximize recovery. This can result in significant pain relief, decrease muscle tension, increase the range of motion, and promote a return to activity. What can I expect to feel with Ultrasound Guided Dry Needling? Many people may not feel the needle insert into the skin. However, once a localized twitch response is elicited, the discomfort can vary drastically. Many people describe the feeling as a muscle cramp. People will soon learn to recognize, and even welcome the sensation, as deactivating the trigger point will decrease pain, restore muscle length and improve function. What conditions can US Guided Dry Needling treat? Ultrasound Guided Dry Needling is a very effective treatment. Your physician and physiotherapist will perform a thorough assessment to determine if you will benefit from US Guided Dry Needling. Ultrasound Guided Dry Needling is available at our 480 Huronia Road location. The fee is $150. The Ultrasound Guided Dry Needling treatment is led by RAPHAEL SOARES. Raphael is a Senior Physiotherapist who has had the opportunity to work in health care centres of excellence treating diverse subsets of patients promoting recovery and prevention. Raphael’s world class education focuses on cutting edge advanced therapies delivering best practice principles. Raphael methodically investigates the primary source of the dysfunction and believes that a client-focused approach associated to an evidence-based practice is the key for an effective model of treatment. He has extensive training in Ultrasound Guided Musculoskeletal Interventions (UK), Osteopathic Techniques (USA, UK, Switzerland) and Functional Dry Needling (USA, Canada). Raphael loves spending quality time with the wife, who is his high school sweetheart, and their lovely daughter. He is always invigorated by snowboarding and surfing. Raphael graduated in Physiotherapy in Rio de Janeiro (Brazil) in 2004 and became registered in Canada in 2012. To schedule an Ultrasound Guided Dry Needling treatment, please call our Eagle Ridge Clinic at 480 Huronia Road at 705.734.3340.